When we launched Publisher University two years ago, our goal was to create a destination to help you get the most from DoubleClick for Publishers and DoubleClick Ad Exchange so you could spend more time focusing on what you do best: creating great content. Feel confident in your decisions, with beginner through advanced content. Track course progress over time so you never miss a step. Access course content and trainings from any device. Learn in the language most comfortable to you; choose from 11 languages. Visit the new Publisher University today to begin getting the most from DoubleClick for Publishers and Ad Exchange, and be on the lookout for new training content to be continually added in the future. 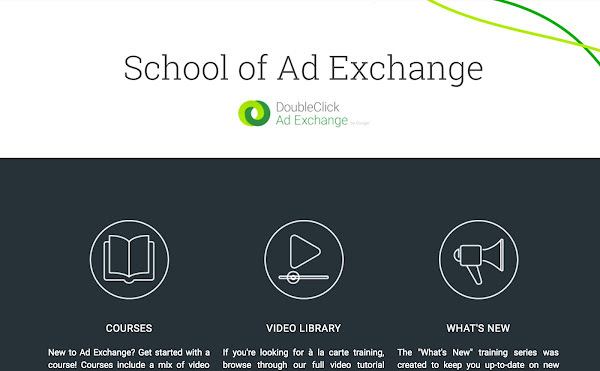 Note: Publisher University is designed for publishes using DoubleClick Ad Exchange or DoubleClick for Publishers. If you’re currently using the Small Business edition of DoubleClick for Publishers, please visit the help center. Over the last few years, the adoption of programmatic has significantly grown across the industry. Demand Media is an early adopter and recently, we caught up with their Senior Director of Media Sales and Operations, Angela Kinsella, on the lessons they’ve learned since increasing their investment in programmatic. Here’s what she shared. Programmatic has evolved significantly over the past few years. It’s no longer just a real-time bidding (RTB) system for remnant inventory, nor is it restricted to standard IAB units. Today, programmatic is a sophisticated technology that can be used to sell virtually all your media through direct deals—including branded executions, custom content, re-skins and more. The true value of programmatic lies in two key areas. The first is access to rich, granular data on buyer needs and campaign performance, which leads to better sales optimization. The second is gains in operational efficiency for the entire advertising ecosystem—from the creative agency down to the publisher. By 2012, Demand Media had seen consistent positive results with the open exchange and we felt ready to deepen our programmatic investment. However, we knew we couldn’t (or shouldn’t) make massive changes to our business overnight. Before we increased our stake in programmatic, we wanted to use our learnings to date to optimize our technological, operational and sales infrastructure. For anyone that’s making this transition now, this is what we’ve learned. In terms of technology, we carefully evaluated our partners to find those best serving our current needs and those who might be best equipped to work with us in the future. Accordingly, we carried out an exhaustive request for information (RFI) with a number of supply-side providers (SSPs). We considered a variety of factors during the process, including each partner’s ability to execute programmatic direct deals, including private marketplaces. We wanted to make sure we chose a partner with access to first-rate advertiser networks, who was committed to keeping up with industry changes. There’s a belief out there that programmatic can replace people. We knew that wasn’t true for us. But we also knew that the way our sales teams worked needed to change. While sales teams are still responsible with building stronger relationships with advertisers, the “sellers of the future” need to be able to speak a new language, one that’s far more metrics-driven than that of the past. Our teams built competency in programmatic concepts and key performance indicators (KPIs) like audience targeting, backend conversions, and more, to ensure informed and productive conversations with buyers. Our sales teams also needed to educate buyers who were slow to shift budgets to programmatic. We had two ways of doing this: programmatic direct and hybrid deals. With programmatic direct, we’re able to give buyers the comfort of knowing what they're buying while setting our own deal terms. Ultimately, this strategy has proved to be a great way for both parties to maintain control of pricing and inventory quality. Programmatic direct has also enabled us to structure additional elements into the deal such as data sharing and “first look,” which has driven up CPMs. Another strategy we’ve used is to offer buyers hybrid deals with both direct and programmatic components. With hybrid deals, we can negotiate a direct sponsorship and then layer on audience and contextual targeting. When buyers see their results, they’re often more open to increasing their programmatic investment. It’s easy to get excited about the potential of programmatic, but it is important to keep in mind that increasing your programmatic investment often results in some level of uncertainty in the short term. Change can be uncomfortable, but can also result in positive results for your business. During transitional times, it’s important to keep the lines of communication open both internally and with buyers to ensure your programmatic strategies evolve and succeed. Our lives are filled with micro-moments: intent-rich moments when we turn to the nearest device to find a store, buy a product or look for answers to all kinds of wants and needs. In these moments, today's consumers decide what to do, where to go, and what to buy. If you're in marketing or analytics, you know this consumer behavior brings new opportunities to reach your customer in the right moment with the right message. At the same time, it's harder than ever to get a complete view of the consumer journey and then make sense of it all. That’s why we’re introducing the Google Analytics 360 Suite, a set of integrated data and marketing analytics products, designed specifically for the needs of enterprise-class marketers. It all starts with understanding consumer behavior in the moment — getting the right insights, and then making your brand useful to consumers. Sophisticated marketers who use analytics platforms are three times more likely to outperform their peers1 in achieving revenue goals. It’s no wonder enterprise-class marketers have been telling us they need more from their marketing analytics tools. Many toolsets can't cope: They're too hard to use, lack sufficient collaboration capabilities, are poorly integrated, and require hard-to-find expertise. Several years ago, Google engineers set out to simplify marketing analytics in the same way we simplified web search with Google.com. With infrastructure that allows us to handle billions and billions of daily search queries — generating answers before users even finish typing — we set out to give enterprise marketers the same utility. See the complete customer journey: Marketers require full visibility and context to see what’s really happening across all customer touchpoints, devices, and channels. Useful insights, not just more data: Marketers need enormous computing power, data science and smart algorithms, all working together to quickly make sense of data for them. In other words, built-in intelligence to do the heavy lifting for marketers and make insights easy to see. Enable better sharing within your organization: Marketers seek to put insights into everyone’s hands and get the whole company on the same page — resulting in stronger cross-functional goals and smarter decision-making. Deliver engaging experiences to the right people: Marketers want to make their brand immediately useful to consumers. With integrations across multiple Google technologies, the suite products not only work well together, but also with other products, including AdWords, DoubleClick, and 3rd-party platforms — enabling marketers to take immediate action and drive business impact. The Google Analytics 360 Suite is built to address these needs. Its powerful set products are unified, providing a consistent user experience and cross product data integrations, plus services. Simply put: it’s a complete measurement platform. Loaded with six products, four of which are brand-new, the Google Analytics 360 Suite offers easy-to-use tools that enable sharing of data and insights throughout an organization. Google Audience Center 360 (beta): This powerful data management platform (DMP) helps marketers understand their customers and find more like them across channels, devices, and campaigns. It offers native integration with Google and DoubleClick, plus it's open to third party data providers, DSPs and more. Google Optimize 360 (beta): This website testing and personalization product helps marketers deliver better experiences. Marketers can show consumers multiple variations of their site and then choose the version that works best for each audience. 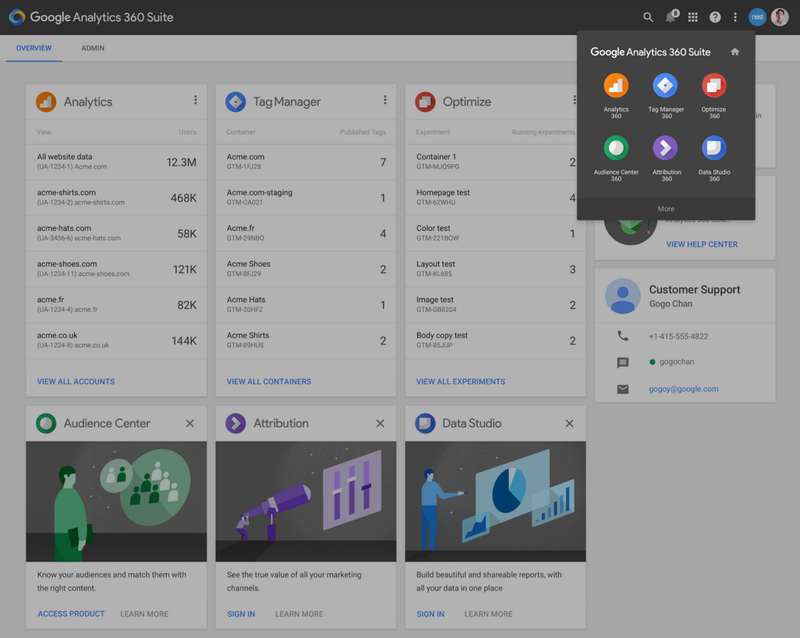 Google Data Studio 360 (beta): A new data analysis and visualization product that integrates data across all suite products and other data sources ― turning it into beautiful, interactive reports and dashboards. Built-in real-time collaboration and sharing is based on Google Docs technology. Google Tag Manager 360: Built from our industry-leading tag management product, it empowers enterprise marketers to move faster and make decisions with confidence. It offers a simplified way to gather site information (all those tiny bits of code) and powerful APIs to increase data accuracy and streamline workflows. Google Analytics 360 (formerly known as GA Premium): will roll out exciting new capabilities throughout the next couple of months as investments continue to grow. It will serve as the measurement centerpiece by analyzing customer data from all touch-points and integrating with our ad products to drive marketing effectiveness. Google Attribution 360 (formerly known as Adometry): has been rebuilt from the ground up to help advertisers value marketing investments and allocate budgets with confidence. Marketers can analyze performance across all channels, devices, and systems to achieve their most effective marketing mix. The Google Analytics 360 Suite offers integrations with many third party data providers and platforms. It also plugs right into Google AdWords and DoubleClick Digital Marketing, our core ad technology. That means marketers can turn analytics into action by combining their own data from multiple sources ― website data, audience data, and customer data (e.g. CRM) and more ― and using it to make ads more relevant for people. When will the Google Analytics 360 Suite launch? The new products -- Audience Center 360, Optimize 360, Data Studio 360, and Tag Manager 360 -- are available today in limited BETA. If you're a Google Analytics Premium or Adometry customer, you will see the products renamed in the coming months, and we'll let you know when you're eligible to join the new betas. This is just the beginning of our ongoing innovation in enterprise marketing analytics -- we can’t wait to share more. In the meantime, visit our website for more details or hear from directly from our customers below. Over the coming weeks we’ll dive into the capabilities and benefits of all the new products on the newly refreshed and renamed Google Analytics Solutions blog, and on our Google+ and Twitter pages. We’d love your feedback. On this blog, we're breaking down the best practices into small, approachable chunks. 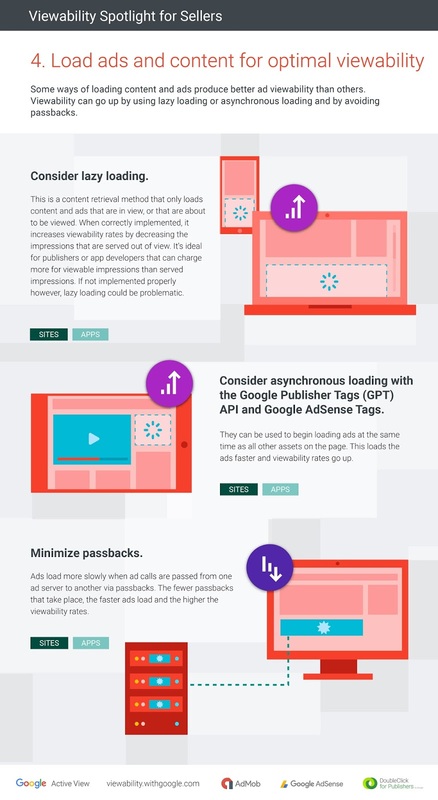 Already, we've focused on two tips for enabling viewability measurement, three speedy ways to improve viewability, and four ways to improve ad layouts for better viewability.In this post you'll learn three content and ad loading methods that can optimize your viewability rates. We hope these recommendations are improving your site or apps ad viewability. On this blog, we're breaking down the best practices into small, approachable chunks. Already, we've focused on two tips for enabling viewability measurement, and three speedy ways to improve viewability. In this post you'll learn tips for laying out ads on a webpage or scrollable page in an app in order to improve viewability rates. In the next part of our Spotlight on Viewability, we'll share three content and ad loading methods that can improve viewability. 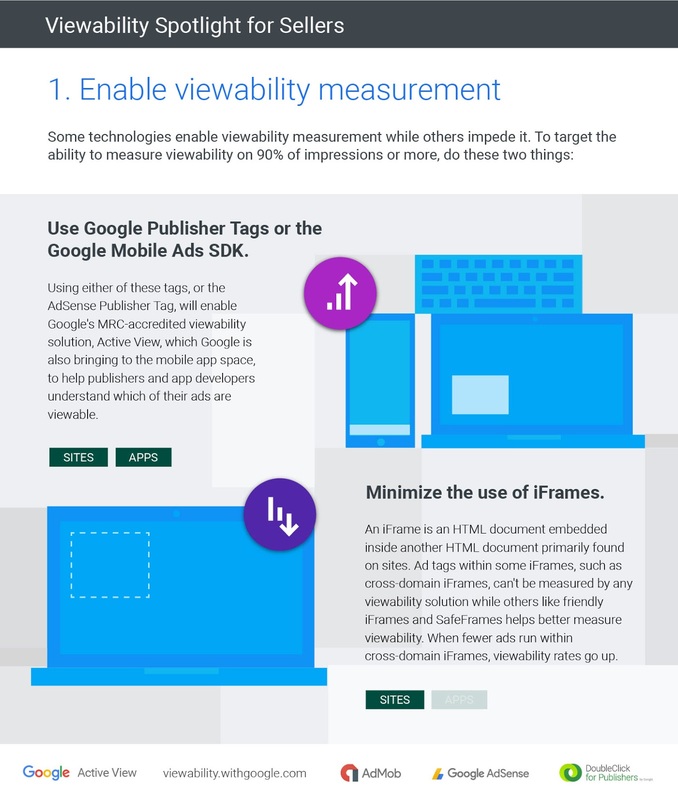 Recently on the blog, we focused on two tips for enabling viewability measurement. 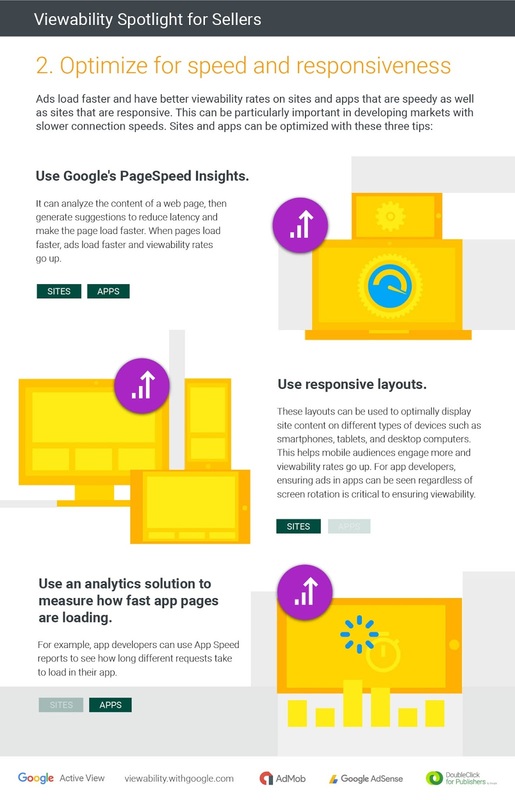 In this post you'll learn tips for improving ad viewability by optimizing your apps and sites for speed and responsiveness. In the next part of our Spotlight on Viewability, we'll share four ways to improve ad layouts for better viewability rates. We hope these recommendations will improve your site or apps ad viewability. In the next part of our Spotlight on Viewability, we'll share three speedy ways to improve viewability.